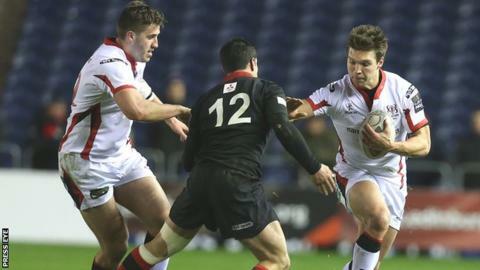 Edinburgh have announced that Ulster's Michael Allen will join them at the end of the season on a two-year contract. The 24-year-old, who can play on the wing or at centre, has been at Ulster since joining from his school team, Methodist College Belfast. He said: "Edinburgh have played some brilliant rugby this year and shown the potential of being a very good side. "I'm just looking forward to getting stuck in and trying to spring anything I can." Allen has represented Ulster at Under-18, Under-19 and Academy levels and made his senior Ulster debut against Leinster in 2011, though it was not until last season, with injuries to Tommy Bowe and Andrew Trimble, that he took his chance to play on the wing. However, his appearances have been restricted with Ireland internationals Bowe, Trimble and Craig Gilroy in the Ulster squad. He said: "I've always been in the centre, played centre all through school and then moved over to the wing to try to get more game time, but I'm happy doing both. Allen has played 45 times for Ulster since making his Ulster debut in 2012, scoring six tries and he admits that leaving his home city of Belfast will take some getting used to. "I've never lived anywhere else, always been in Belfast and I'm probably a bit of a home bird," added the 24-year-old. "I do love the city and everything that comes with it but I'm looking forward to making a change, starting afresh." An Ulster statement thanked Allen for his service to the province and wished him well in the next stage of his career.